Thamel has been the centre of the tourist industry in Kathmandu for over four decades starting from the hippie movement when many artists came to Nepal and spent weeks in Thamel. Also situated in Thamel is the Garden of Dreams - a historical neo-classical garden that was built in 1920. Guests can walk to Thamel from Hotel Shanker. It is less than 1 km away - about 10-12 minutes walking. Alternatively, a taxi ride would take less than 5 minutes. Narayanhiti Royal Palace Museum. Just behind Hotel Shanker..
Durbar Marg, considered the heart of the city, leads to the former Royal Palace of Narayanhiti, now known as the Narayanhiti Palace Museum. Popular among tourists, Durbar Marg is a posh area with casinos, restaurants, pricey boutiques, retail outlets, travel agencies and airline offices. Guests can walk to Durbar Marg from Hotel Shanker. It is less than 1 km away - about 12-15 minutes walking. Alternatively, a taxi ride would take less than 2 minutes. 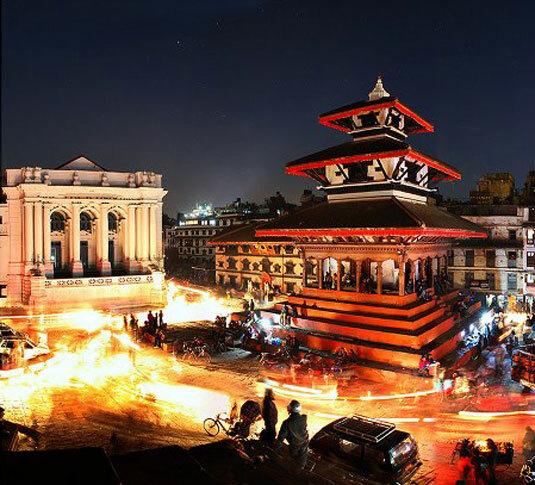 Basantapur Durbar Square at night. Also known as Kathmandu Durbar Square or Hanumandhoka Durbar Square, this spectacular area is the plaza in front of the old royal palace of the Kathmandu Kingdom. It is one of three Durbar Squares in the Kathmandu Valley, all of which are UNESCO World Heritage Sites. Basantapur Durbar Square is surrounded with spectacular architecture and vividly showcases the skills of the Newar artists and craftsmen over several centuries. 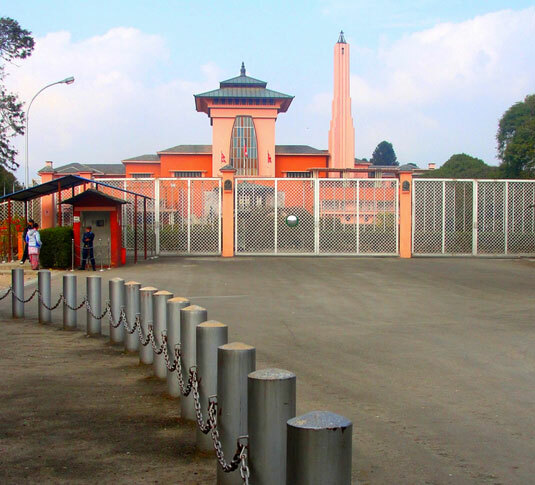 We recommend that guests take a taxi to reach Basantapur Durbar Square from Hotel Shanker. A taxi ride would take about 15 minutes. Swoyambhunath is an ancient religious complex atop a hill in the Kathmandu Valley. It is also known as the Monkey Temple as there are holy monkeys living in the north-west parts of the temple. 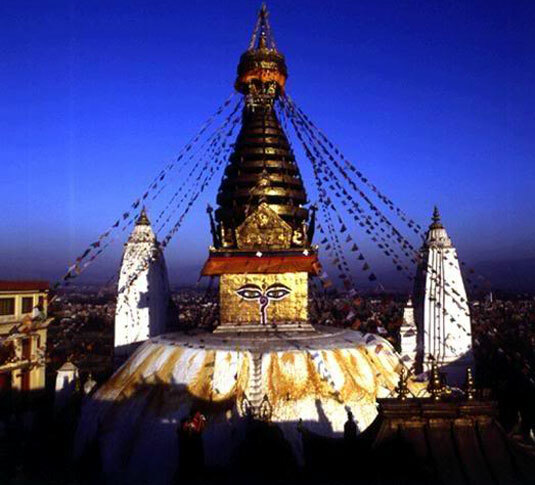 Much of Swayambhunath's iconography comes from the Vajrayana tradition of Newar Buddhism. However, the complex is also an important site for Buddhists of many schools, and is also revered by Hindus. A taxi ride to Swoyambhunath from Hotel Shanker would take about 15 mins. The Pashupatinath temple serves as the seat of the national deity, Lord Pashupatinath. It is regarded as the most sacred among the temples of Lord Shiva (Pashupati). The sacred Shiva Puranas mention this Shivalinga as the bestower of all wishes. A taxi ride to the Pashupatinath Temple from Hotel Shanker would take about 20 minutes.